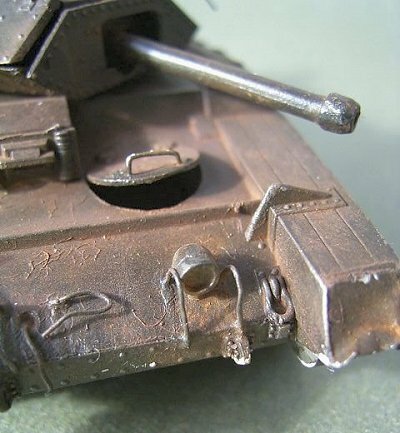 I have often felt that one of the weak points in my modelling is in finishing, especially in simulating various effects of wear and tear. It may be that I like the neat little thingies too much in their out-of-the-box condition to deliberately damage and batter them. However, realizing the sense of life these kind of treatments may give to the model, I wanted to practice my skills in this area. So I decided to dedicate one kit completely to different aging and damaging tests. Normally I model mostly German WW II vehicles, but this time I did not let this limit the choosing of the subject. What I wanted was a nicely detailed kit from the WWII era, that would be easy to build and cheap to purchase. 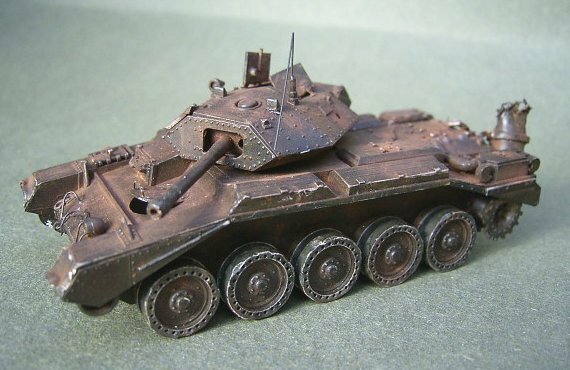 As such I picked up the Crusader Mk III by Revell (formerly Hasegawa). There would have been some other interesting choices in the same price range, too, but the Crusader appeared to be a very suitable model for this kind of purpose. Some of the kits structural solutions put certain limits to the process, however, and for instance the solidly molded inner road wheels prevented any "collapsed spring" experiments. I wanted the model to be somewhat consistent and story-telling in its finished state, not a collection of random bents, bumps, shell penetrations and the like. Hence the model tries to represent a vehicle, which has been in hard active use, then suffered a destructing hit and finally left to the mercies of weather and scavengers. To achieve this I did the following. I built the chassis normally. I then applied some dents and holes with a motor tool to the engine deck and tool boxes, which in reality are made of rather thin material. To achieve a more realistic look, the plastic was thinned to a near scale thickness on the inner side of the parts in question before assembly. By doing this I tried to illustrate that the spare fuel tank on the aft has exploded and damaged the rear of the vehicle. 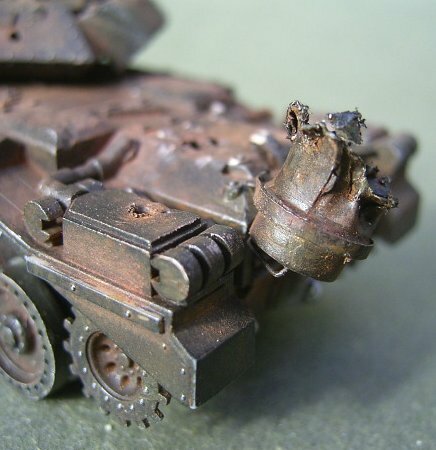 The Crusader used gasoline as fuel, and in the desert heat partly vaporized contents of the tank have blown up by a hit of a red-hot shell splinter. The vehicle has not sufferd fire, thus no burn marks are made. I put together the turret, drilled an anti-tank shell penetration hole (approx. 75 mm calibre) on the left side and simulated the effect of the shock by opening up the seams on the opposite side of the turret, breaking the front armor plate and tilting the main gun to a distorted position. The riveted structure of the turret would have offered a nice, further test bed for experiments with popped out rivets and empty rivet holes, but this would have required a much smaller drill bit (and patience) than I had. Some of the side armor plates and mud guards were replaced with crushed metal foil to give a look of battered and hard-used vehicle. For the same reason I sliced the rubber parts of the road wheels with a knife and a file. I also bent the front light guards, leaving the the other light uninstalled, so that it would appear as if it had been lost in some earlier collision. 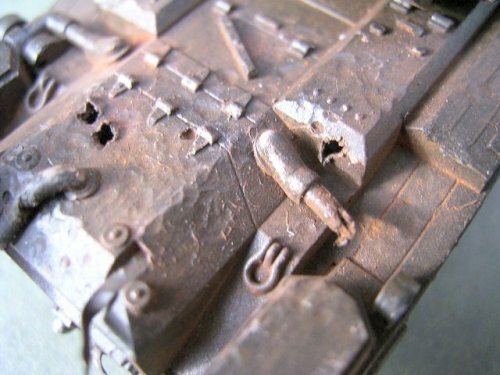 I attached all hatches in open or semi-open position to indicate an internal explosion in the turret and evacuation of the rest of the crew from the hull compartment. I also built the remains of the external fuel tank using metal foil and metals strips, and attached them in a manner as if the tank had been torn up and bent sideways in the explosion. I also replaced the fuel hose and the other exhaust pipe with sections of electric cord cover, cutting and mangling them. The antenna mast was installed in a bent and fallen position. The vehicle is supposed to have stood abandoned as a wreck for a long time. Therefore most of the utilisable parts are salvaged. 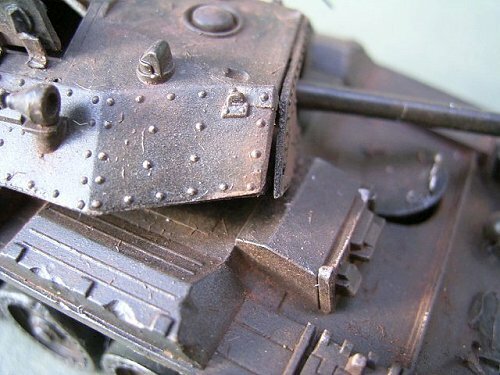 To illustrate this the turret MG is missing and only a drilled hole in the mantlet marks its place. 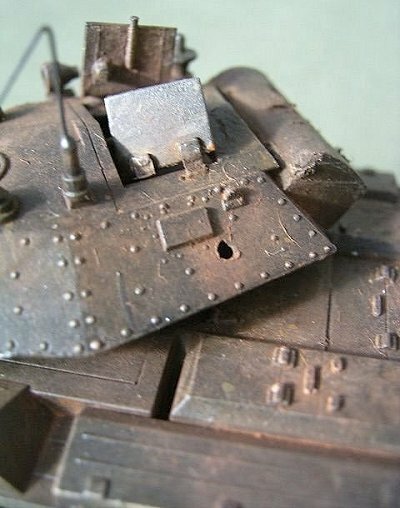 Also the tracks are left off for this reason, as they would have been used as extra armor for some other tank. Some of the tool boxes could have been modelled open for additional impression of a scavenged vehicle, which I did not do. 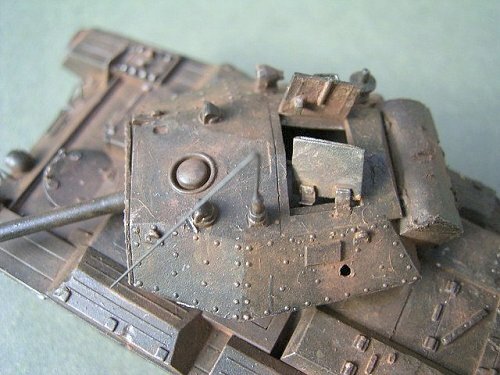 In northern Africa, where most Crusader Mk III tanks served the atmosphere is very humid near the coastal areas, and abandoned tanks rust quickly, lose their paint in sandstorms and get eventually buried in the sand. The model is first painted with a mix of dark grey and gun metal and then washed with diluted orange for rust. After this rusty shades (burnt umber, burnt sienna, orange, ochre, reddish brown) of pastel chalk powder was brushed to all crevasses, indents and notches. Then the whole vehicle was drybrushed with white, after which a black wash was given. Thereafter an additional pastel chalk treatment was performed. Finally a satin varnish coating was applied on top of the whole thing, but since it damped the rusty tones, a third pastel chalk treatment was given. Shiny metal paints were not used at all. 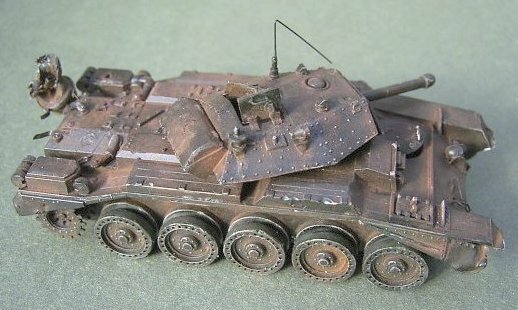 Since there is no paint camouflage left on the vehicle, all experiments with chipped and scraped paint were left to another time. Piled up sand would have been added, had this been a diorama model, but now they are left off. Voilá! The effort may not be completely satisfying, being partly overdone, partly perhaps under-done, but the benefits of the project for me personally were just what I wanted. I feel more secure to try different methods of aging and damaging with other model projects after this experiment. I believe this will be a welcome improvement in my modelling. A big thank you to Ilian Filipov for inspiration and assistance in the preparation phase of this modelling project.